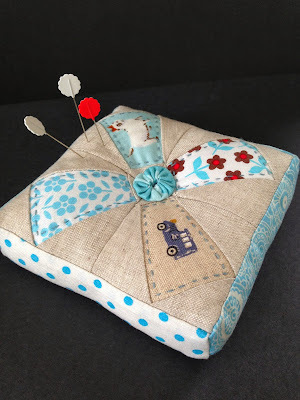 Patchwork n Play: Pincushion Parade! those who want to join in! These were all gifts from blogging friends! that live somewhere else in the world! and use it most days! I decided I should make a couple of new ones too! won in a giveaway a l..o..n..g time ago! They were perfect for this quick little project! Would you like this one to live at your place? I'll draw a winner in a week! Happy 7th blogaversary. I don't need to go in the draw, but my favourite pin cushion incorporates vintage embroidery(from an old serviette of my nan's) text fabric and linen, I keep all my pretty pearl top pins that were used to make my wedding dress. Happy 7th! My favourite pincushion was made by a blogfriend from Sydney. I’ve used it since the day I received it. It has one embroidered side and one flowery side filled with pins. It’s really tiny (2,5" square). It lives in a small zippered bag, also received from a blogfriend, that I carry around all day, together with some small scissors, threads and pens. Wow - 7 years! 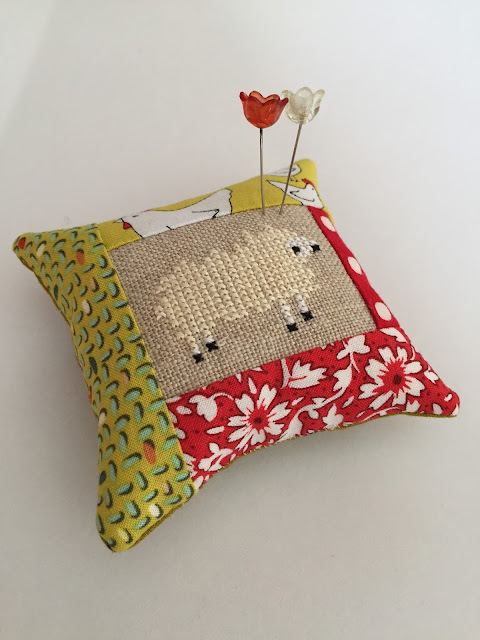 The sheep pincushion is very cute. 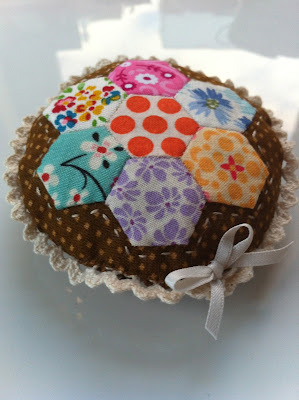 My favorite is a Pincushion made of all tiny EPP hexies filled with walnut shells and I keep it in my hand sewing bag. One of my favorites is the one from Patchwork, Please! Like you have above! 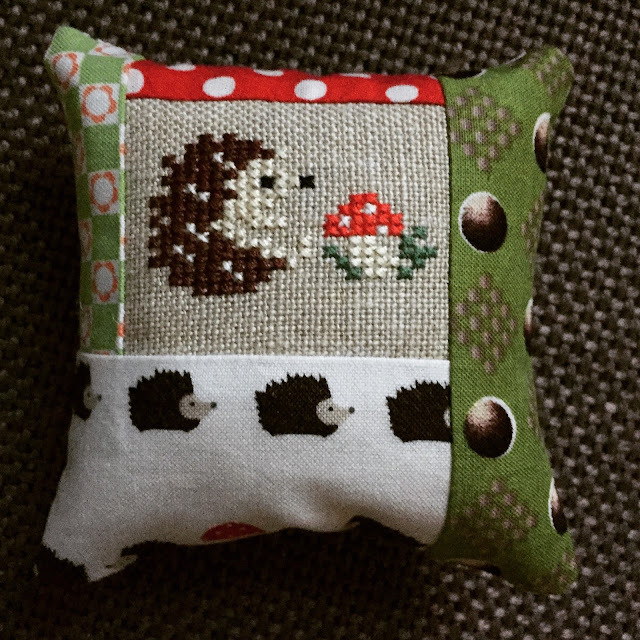 I most recently love the Red Riding Hood pincushion that I received as an extra in a swap. The rest of the swap was also incredible. Other than that, I have a hand dyed wool pincushion that I made using an odd shaped scrap and just stitching it together wherever I could make a seam. So fun to see all your pincushions--you have quite a variety. I had to go and look up my blogging years--I'm over ten years now. (Guess I should do something fun, too!). I don't use pincushions, so don't enter me in the drawing, but I hope that sweet lamb goes to someone who really loves it--it's terrific! Congratulations on seven years Susan!! Next month will be eight years for me. I love all your pincushions, especially those sweet cross stitch pinnies. With the pinnie parade, I've been going through all my pincushions too....don't think I could name a favorite. You do have a lovely collection of pin cushions. It is funny how certain ones can become favourites. I have a little square one made of wool with a simple embroidery. I think it is the feel of the wool that makes me like using it. Have fun with your give away and your anniversary. Congratulations. Love the new look blog page and the quilt in the header - beautiful. group using ribbon embroidery it is only small so great to hold applique pins. Happy blogaversary. 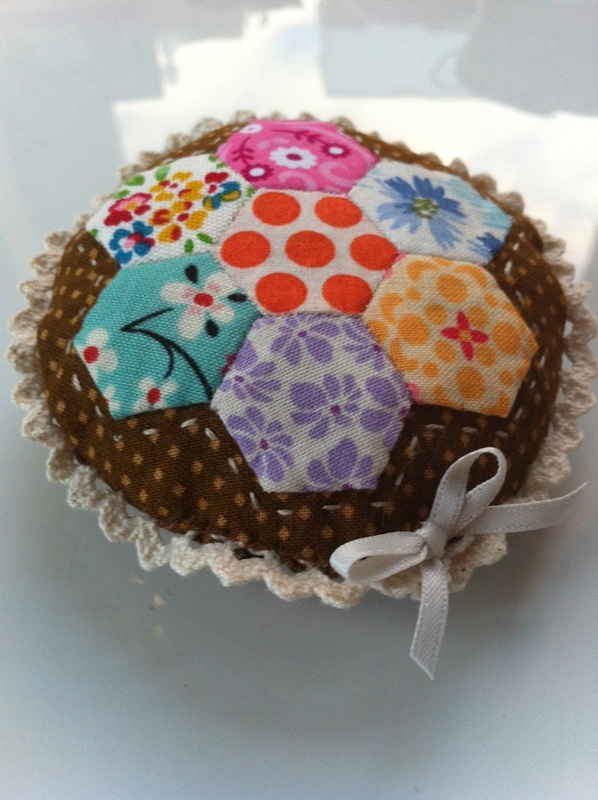 You have some pretty cute pin cushions! It's hard to pick a favorite from my collection. Maybe my little wool strawberry mounted on a golf tee that fits into the top of a spool--very handy when hand stitching! Is it wrong that I don't have strong feelings about my pin cushion? 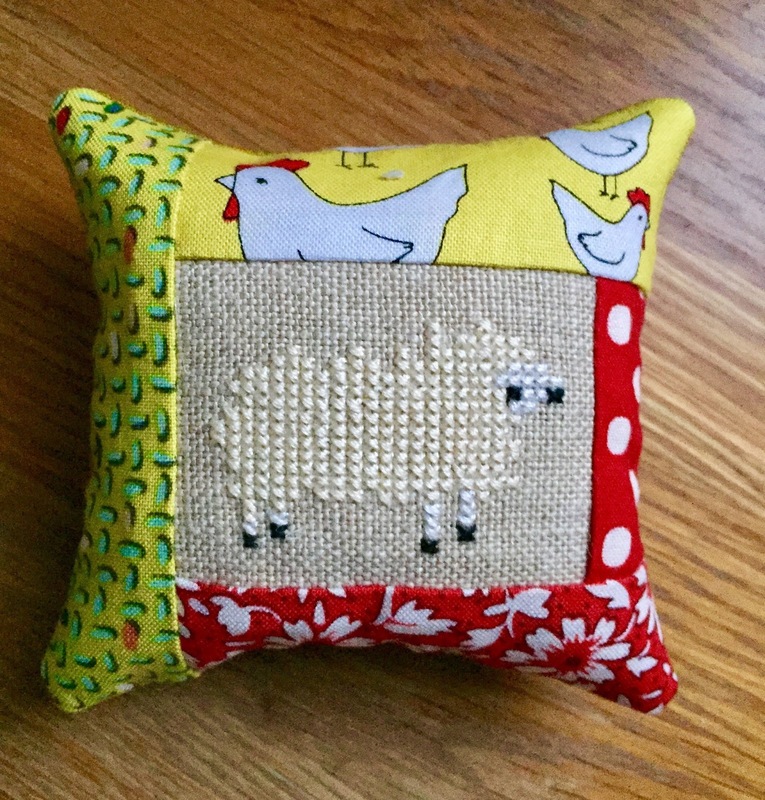 I made and use a wool applique pin cushion that I like... (rectangular maybe 5x2" filled with silica sand) but don't have a close relationship with. But I do think your sheepie pincushion should come and live in NZ! 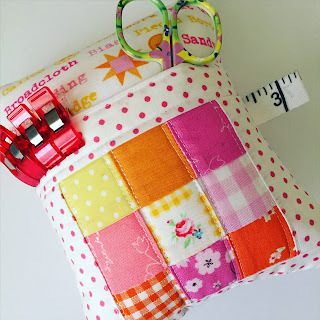 Congratulations on seven years of blogging, especially for continuing in this current age of Instagram :-) I only have one pin cushion - won from Jeliquilts on her blog a few years ago. It lives on my tray of sewing tools next to my machine! No need to enter me your drawing as I too have pin cushions to use... more than I need! Just wanted to say that yours are adorable, especially that one from the book. 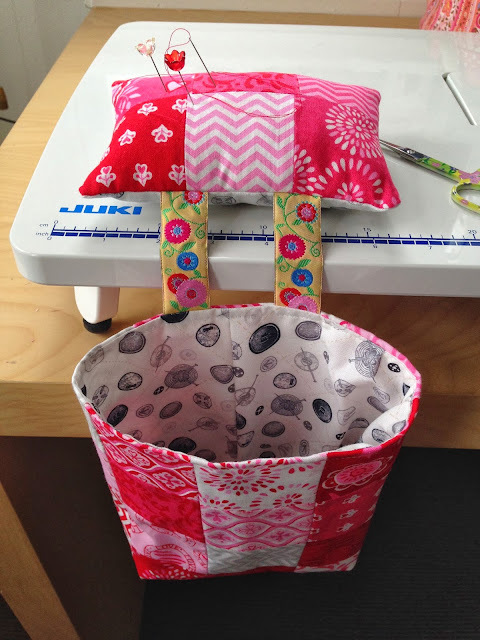 Is the name of the book "Sew Organized for the Busy Girl"? It's the pinnie with the pocket, that you have shown with scissors and Wonder Clips. I've always liked that pattern. Whoever thought of doing a pincushion parade had a great idea! How sweet! What a great idea to use your cross stitch! 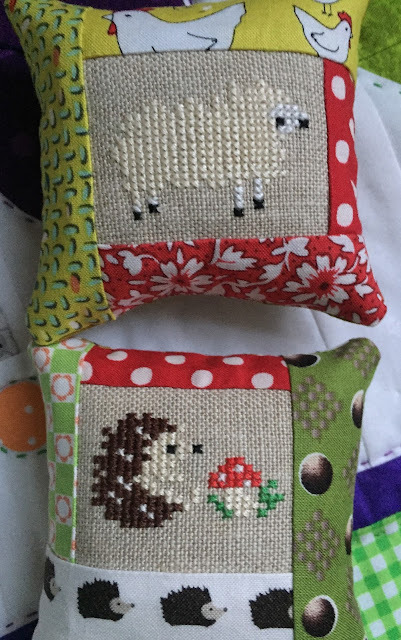 My favourites are the 'ouch' pincushion Rachel sent me and my most recent Liberty scrap one I made with pompom trim! Happy 7th Suz! All of your pincushions are lovely. 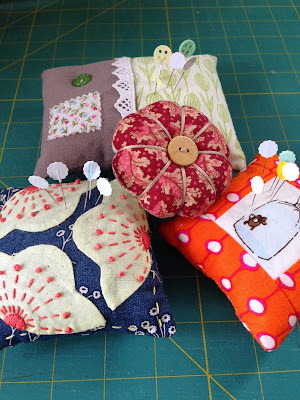 Your post has caused me to reflect on pincushions and I realize that I have been a recipient of some beautiful pincushions and they are all over my studio and around the house. I should make some with all of the scraps I have. 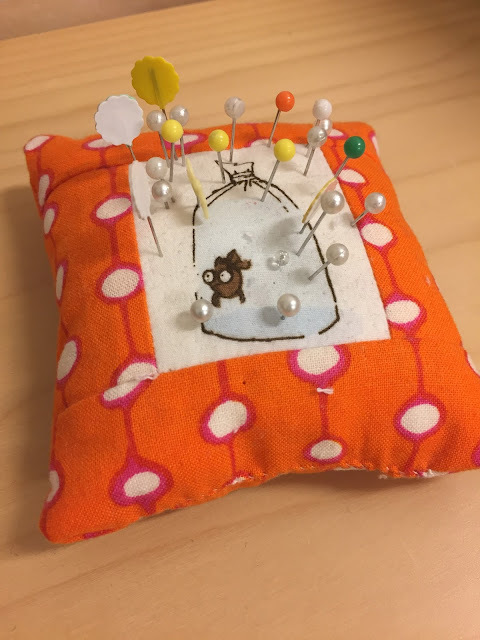 I'm not entering the pincushion drawing, as much as I want to, but I already have some other wonderful creations you've made for me, so another lucky person should experience this pure joy.